The morning after Election Day, 2008, The New York Times proclaimed that Barack Obama’s victory had swept “away the last racial barrier in American politics.” However, as the President’s first term draws to a close, a case can be made that the historic election was anything but post-racial; rather, it has been the most racially polarizing presidency in modern times. This is not a surprise, however, to those familiar with Obama’s background and thinking on racial matters, nor to those who have studied the role played by Communist Frank Marshall Davis in raising him as a young man in Hawaii during his critical coming of age period. Davis was not only a slavish follower of Joseph Stalin, but a black racist who saw sinister white plots in the foreign policies of the United States and other Western nations. Some of this information about Davis was available in 2008, when Accuracy in Media disclosed the fact that Obama’s mentor “Frank” in his book, Dreams from My Father, was actually Frank Marshall Davis. We noted that, by Obama’s own account, Davis had subjected the young man to racial advice and diatribes. However, the Kengor book draws upon many of Davis’s columns, published in Communist papers in Chicago and Hawaii, where these views were put into print. Hence, it expands our understanding of Davis—and therefore Obama. What’s more, Kengor looks at Davis’s views in terms of Obama’s policies as President. In 2008 the major media didn’t want to hear about any of this. Jon Meacham wrote in Newsweek that Frank Marshall Davis was “a strong voice for racial justice” and political activist whose “writings on civil-rights and labor issues” had “prompted a McCarthyite denunciation by the House Un-American Activities Committee.” Meacham was suggesting that Davis was the target of false allegations, and that he was not a communist. But Meacham was negligent to the point of dishonesty. In the first place, Senator Joseph McCarthy was not obviously in charge of any House committee. Second, Davis was in fact a card-carrying communist. Is this the playbook being used against opponents of Obama? What kind of influence did Davis have on the President? This article is meant to examine in-depth, the racial, if not racist, agenda of the Obama administration. 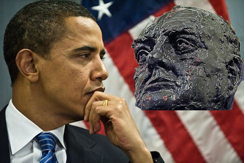 The new evidence about the racist influence that Frank Marshall Davis had over Barack Obama puts these matters in a new and frightening perspective. Seemingly spontaneous comments Obama has made on racial matters take on a new significance in view of the Kengor book and his revelations about Davis and Obama. 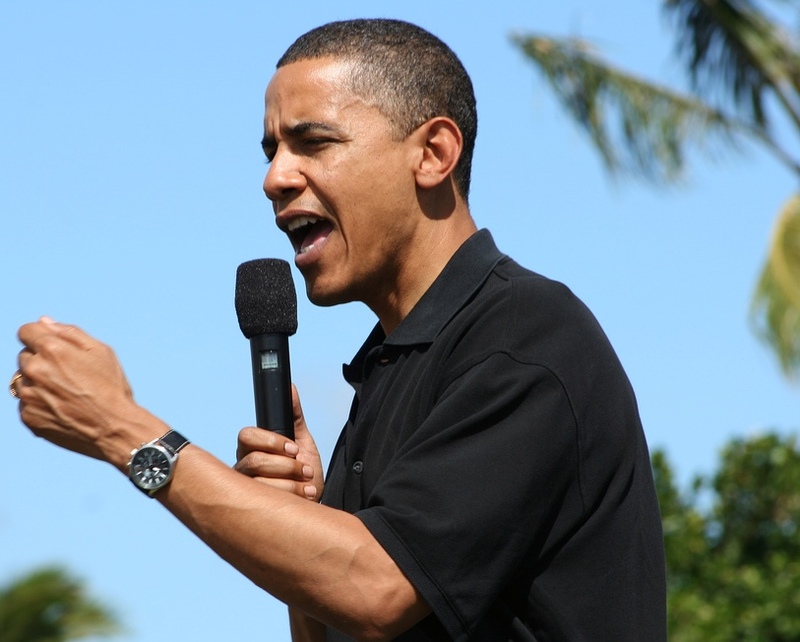 The upcoming election will likely see an escalation of racial tactics on Obama’s part. Indeed, as the 2012 election season grows red hot, the President and his election campaign have demonstrated that their strategy will remain anything other than shades of gray. It began in early June, when the campaign launched an overt attempt to court African-Americans with a radio ad aimed specifically at black voters. The Grio reported that “The 60-second ad, entitled ‘We’ve Got Your Back,’ appeals to black voters’ nostalgia about the election of the nation’s first African-American president, calling for those voters to stand with the president again in November.” According to an advertising representative, this particular type of ad would normally come out during “get out the vote” efforts. So the playing of the race card is ahead of schedule. As you’ll see, however, the President has already been governing through a prism of black and white. As AIM has disclosed, even some of the Obama stimulus dollars have gone for racial purposes. Joshua Correll, a University of Chicago professor, received $154,563 in stimulus grant money for what is called a collaborative project at the University of Chicago which “outlines a series of studies investigating the role of individual differences in executive functions (EFs) in expression of implicit racial bias.” This appears to be academic jargon for identifying and naming alleged racists. In fact, Correll operates a “Stereotyping & Prejudice Research Laboratory” that has been working since 2000 to develop and refine a first-person-shooter video game that was originally designed to ferret out allegedly racist cops in order to re-educate them. The President’s policy on terrorism seems to play the race card when convenient, but very inconsistently. In the summer of 2010, Obama suggested that race is what motivates the actions of Al-Qaeda, as opposed to blind, radical ideology. The discussion was in stark contrast to several months earlier, when the administration was unable or unwilling to mention race, religion, or creed when reporting on the motivations of Fort Hood terrorist, Major Nidal Malik Hasan. The Pentagon had released a report on the shooting rampage which failed to mention the word “Islam” or “Muslim.” In turn, while Obama did not wish to stir up anti-Muslim sentiments in the Hasan case, he was more than willing to play up anti-Muslim sentiments when he claimed that Israel is suspicious of him because his middle name is Hussein. In March of 2010, the Obama administration filed a brief with the Fifth Circuit Court of Appeals that supported the University of Texas’ use of racial preferences in their undergraduate admissions process. The brief had been filed by then solicitor general and current Justice, Elena Kagan, and stems from a battle over a 2003 ruling that narrowly permitted race-conscious policies in public higher education. Such blatant support for the exploitation of race in education was panned by the National Review’s Roger Clegg, when he described the brief as “a full-throated endorsement of such discrimination.” The Supreme Court has opted to review the affirmative action case, which is expected to occur in October—placing it squarely in the minds of voters just weeks prior to the presidential election. Paul Kengor says that, in writing his book on Davis, “the most difficult issue always was knowing precisely where and when Davis influenced Obama on specific thoughts and issues, especially in light of what Obama has pursued as president.” But Kengor comes to some interesting conclusions. Davis clearly left an imprint on the young Barack Obama, as evidenced in his past actions. While Obama has oft been touted as being the nation’s first post-racial President, he has amassed a background and resume which point to the contrary. But what effect has this divisive governance had on the American public in general? Presented with very little concrete evidence, two groups of people came to very differing conclusions: 35% of whites described Martin’s death as racially motivated, while 80% of African-Americans felt the same way (see Figure 1). Where did the information on this case come from, and was it an accurate portrayal of the facts—or was it meant to divide? And why didn’t Obama use his presidential pulpit to appeal for racial harmony, rather than exploit divisions and differences? The President’s first public comments on the Martin case invoked personal imagery, stating that “If I had a son, he’d look like Trayvon.” The sentiment raised eyebrows among skeptics who viewed it as saying the tragedy bore greater importance because the victim and the President shared similar physical characteristics—namely skin color. But also complicit in the stoking of racial flames in this particular case were some of the President’s closest allies—the mainstream media—through doctored recordings, poorly analyzed video, and a failure to report facts. ABC News obtained exclusive police surveillance video of George Zimmerman taken on the night of the shooting, video which they proclaimed showed “no blood or bruises” on the suspect. It was a critical piece of evidence, one which the Martin family lawyer had declared “a smoking gun,” countering Zimmerman’s long maintained version of events that indicated he had fired his weapon in self-defense. In their rush to air the video, ABC failed to perform any kind of enhancement or analysis, whether in-house or by experts. Worse, there were suggestions by some that ABC had actually gone out of their way to include a graphic in their video presentation that covered up the back of Zimmerman’s head, avoiding any scrutiny that may have resulted in visual evidence of the wounds. A report from Pajamas Media contributor Bob Owens stated, “ABC News used a strategically placed chyron (graphic) to cover up the back of Zimmerman’s head for their broadcast, covering up the video evidence that would have disproven their story “. Owens added, “ABC News doctored the video to sell a false narrative, in a dishonest attempt to brand a man a murderer”. Within a couple of days after the video’s release, reporters at the Daily Caller and Breitbart.com had performed their own video enhancements, concluding that there was sufficient evidence to suggest ABC had jumped the gun in assuming that there had been no evidence of a struggle, noting what appeared to be a head injury on Zimmerman. But this selective representation of a key video was minor in comparison to the case of journalistic malpractice being exercised over at NBC News. The fallout should have been readily apparent—when it comes to race, the media also exhibits radical liberal, and therefore racial bias. They were quick to launch judgments in the Trayvon Martin case, opening themselves to a slew of charges ranging from sensationalist, to bombastic, to untruthful—but most certainly, racially motivated. Additionally, there were serious crimes that occurred post-Trayvon, some even including violence inspired by the case, and some which had a racial component. Would they also be reported? 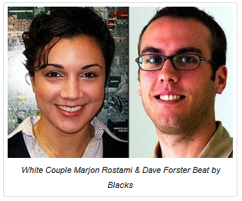 Nowhere was the media whitewash of hate crimes of equal import, but of reversed skin tones, more personified than the story of Dave Forster and Marjon Rostami. The pair had stopped their vehicle at an intersection in Norfolk, Virginia, awaiting a red light. There were dozens of young people standing by, one of whom launched a rock at the car window. When Mr. Forster emerged to confront the vandal, a beating ensued that included wave after wave of young men kicking and punching Forster and Rostami alike. The two victims were white. The alleged assailants, black. The media buried the story for weeks, including the local Virginian-Pilot, which only ran news of the assault as a side note opinion article two weeks later. Norfolk residents were outraged that a possible racially motivated attack had occurred in their hometown, and the big name paper of note refused to acknowledge it—despite the fact that the victims, Forster and Rostami, are reporters … at the Virginian-Pilot. It wasn’t the first racially motivated beating since the Trayvon Martin case to go under-reported. On April 4th, a 50-year-old white man was beaten severely with a hammer by a pair of black teens, resulting in the man being placed on life support. The attack occurred just east of Trayvon Martin’s hometown of Sanford, Florida, on the same day that Al Sharpton, Jesse Jackson and leaders of the New Black Panther Party were holding rallies to protest the Martin case. A mugging took place in Chicago that involved a white man who was repeatedly punched in the head by two black teens while he was down on the ground. The incident began when one of the suspects demanded that the victim “empty your pockets, white boy.” Shortly after his arrest, one of the suspects earned himself “hate crime” status, telling police he was upset by the Trayvon Martin case and beat the man up because he was white. At the Wisconsin state fair, a mob of violent black youths targeted fair-goers by randomly beating them as opening night came to a close. Witnesses themselves classified the incident as racially motivated, with one individual telling Newsradio 620 WTMJ, “It looked like they were just going after white guys, white people.” Thus far, the mainstream media and the administration have declined to look further into the attacks. 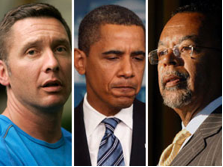 But Obama is not alone in fanning the flames of racism in America, or in government. In early May, Democrats in the House of Representatives attended an actual training course on how to address the issue of race as a way to defend government programs. 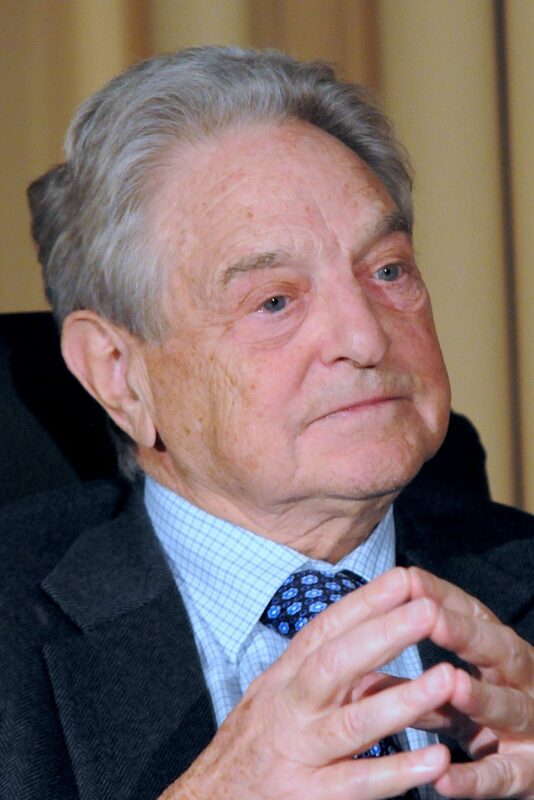 Maya Wiley, President of the Center for Social Inclusion (CSI) as well as the Chair of the Tides Network Board at the George Soros-funded Tides Foundation, showed Democrats how they can take seemingly mundane free market rhetoric, and transform it into incendiary material branded with racism. In her distributed remarks, Wiley criticized “conservative messages [that are] racially ‘coded’ and had images of people of color that we commonly see used” and proposed tactics for countering the Republicans’ presumably coded rhetoric. That rhetoric, according to the CSI website “has dominated debates of racial justice—undermining efforts to create a more equal society, and tearing apart the social safety net in the process” for the last 25 years or more. How will these tactics be utilized in the upcoming election? AIM exposed this strategy in Jim Simpson’s special report, The Left’s National Vote Fraud Strategy Exposed. Suffice it to say that voter registration rolls are wrought with inaccuracies—something both sides of the political aisle should want to contain, as it effects the integrity of the fundamental right in our nation to vote—but the administration is fighting tooth and nail to prevent any improvements in accuracy. One in eight active registrations is invalid or inaccurate. At the same time, one in four people who are eligible to vote—at least 51 million potential voters—are not registered. Inaccuracies included nearly two million dead people, and nearly three million people with multiple state registrations. The report found that there are about 1.8 million dead people listed as active voters. Some 2.8 million people have active registrations in more than one state. And 12 million registrations have errors serious enough to make it unlikely that mailings based on them will reach voters. “These problems waste taxpayer dollars, undermine voter confidence and fuel partisan disputes over the integrity of our elections,” said David Becker, director of election initiatives at the center. The Times report actually hints that an online system using voter ID may be a solution—a seemingly common sense argument. Yet the opposite viewpoint has been held by the Obama Administration and liberal Democrats. Why? Not because the Democrats actually believe that minorities are incapable of attaining proper photo identification (as evidenced by photo ID requirements to attend Democrat conventions and meetings with the President) but rather, because they understand that victory is far less likely without illegal voters on the rolls. Attorney General Eric Holder has been at the forefront here, opposing voter ID laws at every turn, branding them as a racist effort to suppress the minority vote. Holder has instigated lawsuits in an attempt to block voter ID laws in Texas and South Carolina, and most recently in Florida, a state which is actively trying to purge its voter rolls of dead and foreign voters. This, despite a 6-3 ruling by the United States Supreme Court in 2008 upholding Indiana’s right to require such identification for voting. In a speech to the Council of Black Churches, Holder lumped voter ID laws into the same category as “white discrimination” and warned church leaders that their implementation could place “some of the achievements that defined the civil rights movement” in peril. Holder asserted that the right to vote is being threatened, and he is correct in a sense. The right to cast a vote legally by the average law-abiding citizen is being threatened by the administration’s belief that allowing others to vote illegally in an attempt to gain political power is a positive thing. Aside from actively allowing illegal votes, the Obama administration has also made an unprecedented move in trying to grant voting power to illegals. Recently, President Obama issued a “deferred action” executive order which halts the deportation of some 800,000 illegal immigrants. The policy bypasses Congress, a tactic the President has used repeatedly, and achieves in part the goals set forth by the DREAM Act, a plan that creates a path to citizenship for young people who have entered the country illegally, but may have attended college or served in the military. The tactic is pure politics—but uses a racial divide to attain an election goal by targeting and using the Latino population through pure pandering. The move came less than one week before both Presidential candidates were due to speak at the National Association of Latino Elected and Appointed Officials’ annual conference in Orlando, Florida. Granting amnesty to illegal immigrants has long been a goal of the administration and Democrats in general. Illegal aliens, individuals with no regard for United States immigration law, may be the only path to victory for President Obama in 2012. And it has been in the works for some time. Take the case of Eliseo Medina, for example. Medina previously served as a member of Obama’s National Latino Advisory Council and is today an honorary chair of the Democratic Socialists of America. As such, he used the platform of an America’s Future Now! conference in 2009 to outline a plan for long-term Democratic rule through blanket amnesty. The Obama Administration’s tactics are to exploit and manipulate racial and ethnic differences for political gain. This is not an accident but a deliberate political strategy that one can find in the mind of Obama’s communist mentor Frank Marshall Davis, who “educated” Obama during his critical growing up years. Black people, Davis told Obama, have “reason to hate.” The evidence shows that Obama has incorporated that hatred in his policies and pronouncements. Rusty Weiss is a freelance journalist focusing on the conservative movement and its political agenda. He has been writing conservatively charged articles for several years in the upstate New York area, and his writings have appeared in the Daily Caller, American Thinker, FoxNews.com, Big Government, the Times Union, and the Troy Record. He is also the Editor for two major technology newsletters. You can e-mail Rusty @ weiss.rusty@gmail.com, or follow him on Twitter @rustyweiss74. Cliff Kincaid is the Director of the AIM Center for Investigative Journalism and can be contacted at cliff.kincaid@aim.org.